These terms and conditions govern all purchases from the TechnoMobi Online Shop. By using www.technomobi.co.za/shop (the "Website") whether as a visitor or a registered User (the "User" or the "Customer") to browse or purchase any product on the Website you, the Visitor / User / Customer, are bound by these terms and conditions ("Terms & Conditions"). www.technomobi.co.za/shop is owned and operated by EOS (Pty) Ltd, a company registered in terms of South African law with registration number: 2012/078924/07, VAT number: 4860234840 (hereinafter referred to as "TechnoMobi"). You may only purchase goods from this website if you are 18 years or older. If you are under 18, you may only purchase goods from this website with consent of your legal guardian. By accepting these terms and conditions you confirm that you are at least 18 years of age, or that you have your legal guardians consent. All Credit/Debit card transactions are Secure Socket Layers encrypted TechnoMobi' registration documents and the Website's registered domain name are checked and verified. TechnoMobi shall take all reasonable steps to protect the customer's information. For the purpose of this clause, "personal information" shall be defined as detailed in the Promotion of Access to Information Act 2 of 2000 (PAIA). In order to purchase any products from the Website, you have to be a registered User and logged in using your own unique log in details. An Agreement of Sale will only be effective when the customer electronically submits a successful order and a payment has been authorized and received by TechnoMobi. Placing a product in a shopping basket without completing the purchase cycle does not constitute an agreement of sale; and/or constitute an order for such product. TechnoMobi shall not be held liable if such product is not available when the purchase cycle is completed at a later stage. TechnoMobi may remove such product from a shopping basket if no stock is available. TechnoMobi reserves the right to refuse any order / Agreement of Sales or process any payment thereof; this includes but is not limited to partial orders, for whatsoever reason without giving reason to the customer. All products and pricing are subject to stock availability. The price of each product will be displayed with the product listing. In the event of a sales or special offer, the discounted price shall be displayed. TechnoMobi makes every effort to ensure that the information supplied on the Website is accurate and that the products offered are available, however, where delays and out of stock situations occur, customers will be informed thereof. TechnoMobi shall within reasonable efforts, ensure that products offered are available, however should items be ordered and TechnoMobi is not able to fulfill the orders, TechnoMobi shall only be liable to refund the amounts received by the customer for such products. TechnoMobi reserves the right to change any product offered on the Website without prior given notice. If the SIM is Rica registered, it will automatically be activated when the customer inserts it into a device (cellphone or data modem). Your Vodacom SIM Card, can take up to 24 hours to be active on the Vodacom Network. If the SIM card is not registered in terms of RICA and is inserted into a device, the activation will not be allowed. An SMS will be sent to the SIM card informing the customer to register before the activation will be possible. Your Vodacom Sim Card, can take up to 24 hours to be active on the Vodacom Network. Once the SIM card is automatically activated, the customer will receive a welcome SMS with the new cellphone number. Your Vodacom SIM Card, can take up to 24 hours to be active on the Vodacom Network. Credit/Debit Card transactions shall only be refunded back to a bank account and not to that of the Credit/Debit Card, which the purchase was made against. All refunds may take up to 21 working days to process. Original ID document / Passport; and Proof of Physical Address - Not older than 3 months E.g. Utility bill, tax return, municipal rates or any other document that confirms the residential address of the customer In the event that the Customer is unable to produce any of the above documents (identification and proof of address) the courier driver will not deliver the products. All risk, including but not limited to risk of loss, theft, damage or unauthorized use, in and to the product which is the subject of the agreement of the sale shall pass to the customer on delivery thereof to the customer. ✱ the product is undamaged and is in its original packaging including all accessories and any other promotional items, if any. TechnoMobi reserves the right to levy a reasonable usage charge in respect of returned goods. A record of each sales order and any related transaction between the customer and TechnoMobi shall be maintained on the Online Website. The customer shall only be able to view and print such record during the initial 12 (Twelve) month period. It shall be the responsibility of the customer to retain the record of the relevant sale or related transaction thereafter. "Blacklist" shall mean the disablement by electronic or other means, of a Cellular phone thereby preventing its further use on the Vodacom Network. "Greylist" shall mean the disablement by electronic or other means, of a SIM card thereby preventing its further use on the Vodacom Network. Any law enforcement agencies that require the information for the preventing or investigation of criminal activities. Any of TechnoMobi’ shareholders, related entities, suppliers, agents or professional advisors for reporting, accounting, product supply, marketing and/or auditing purposes. Notwithstanding anything to the contrary herein contained, TechnoMobi shall be entitled to utilize the Customer's call records for tracing purposes as required by it in terms of law. Whilst every effort has been made by TechnoMobi and its suppliers of information, to ensure the proper performance of this website, the accuracy of the information/images and the reliability of the binary data on this website, TechnoMobi, its affiliated companies, suppliers, or any of their employees, do not guarantee the availability of the Website, content and information offered on the Website or the accuracy of the information and/or images on this Website. TechnoMobi makes no representations or warranties, whether express or implied, and assume no liability or responsibility for the proper performance of this Website and/or the services and/or the information and/or images contained on the Website, are thus used at the customer's own risk. In particular TechnoMobi makes no warranty that the Website will meet the customer's requirements, be uninterrupted, complete, timely, secure or error free. The Website is supplied on an "as is" basis and has not been compiled or supplied to meet the customer's individual requirements. It is the customer's sole responsibility to satisfy the customer's self, prior to accepting these Terms and Conditions that the service available from and through this Website will meet the customer's individual requirements and be compatible with the customer's hardware and/or software. The Website may contain hyper-links to third party sites. TechnoMobi is not responsible for the content of, or the services offered by those sites. The hyper-link(s) are provided solely for the customer convenience and should not be construed as an express or implied endorsement by use of the site(s) or the products or services provided therein. The customers access those sites and use their products and services solely at the customer's own risk. This Website is hosted, controlled and operated from the Republic of South Africa and therefore governed by South African law and, subject to the 'Disputes' clause of these Terms & Conditions, the customer submit to the jurisdiction of the South African courts. ✱ to ensure that the goods are received by the addressee. ✱ The customer may elect not to receive any communications from TechnoMobi and/or its partners / affiliates. TechnoMobi shall not disclose the customer's personal information unless - the customer consent thereto; or through due legal process. TechnoMobi may compile, use and share any information that does not relate to any specific individual; and TechnoMobi owns and retains all rights to non-personal statistical information collected and compiled by TechnoMobi. TechnoMobi shall not pass on customer information to any third parties for Marketing purposes, only TechnoMobi and its affiliated vendors shall contact the customer to promote its products and services. Any person that delivers or attempts to deliver any damaging code to this Website or attempts to gain unauthorized access to any page on this Website shall be prosecuted and civil damages shall be claimed in the event that TechnoMobi suffers any damage or loss. ✱ not be disclosed to any third party. The customer allows TechnoMobi to take all reasonable steps to ensure the integrity and security of the Website and back-office applications. All credit card transactions are Secure Socket Layers encrypted TechnoMobi’ registration documents and the Website's registered domain name are checked and verified. TechnoMobi may, in its sole discretion, change these Terms & Conditions or any part thereof at any time with or without notice. It is the customer responsibility to visit the Website to see whether the Terms & Conditions have been amended and ensure that the customer is satisfied with the amendments. Should the customer not be satisfied with the amendments, the customer must refrain from placing any further orders on, or from using in any way, the Website. Save for urgent or interim relief which may be granted by a competent court, in the event of any dispute of any nature whatsoever arising between the customer and TechnoMobi on any matter provided for in, or arising out of these Terms & Conditions, and not resolved through the Customer Care Department of Vodacom, then such a dispute shall be submitted to confidential arbitration in terms of the expedited rules of the Arbitration Foundation of South Africa. Arbitration proceedings shall be conducted in Johannesburg in English. 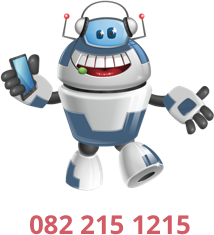 TechnoMobi chooses as its address at which it will receive all correspondence or legal notices for all purposes under these Terms & Conditions, whether in respect of court process, notice, or other documents or communication of whatsoever nature, the following address: (Physical address) TechnoMobi, 17 Impala Road, Doringkloof, Centurion. These Terms & Conditions shall commence from the date on which they are published on the Website and continue indefinitely, as amended by TechnoMobi from time to time, for so long as the Website exists and is operational, TechnoMobi being entitled to terminate these Terms & Conditions and/or shut down the Website at any time. Any and all copyright subsisting in the Website, including these Terms & Conditions, vests in TechnoMobi and all rights not expressly granted are reserved. TechnoMobi cannot screen or edit all the content available from the Website and does not accept any liability for illegal, defamatory or obscene content. The customers are encouraged to inform TechnoMobi of any content that may be offensive or illegal. All the content, trademarks and data on this Website, including but not limited to, software, databases, text, graphics, icons, hyperlinks, private information, designs and agreements, are the property of or licensed to TechnoMobi and as such are protected from infringement by local and international legislation and treaties. When the customer visits the Website or send e-mails to TechnoMobi, the customer consent to receiving communications from TechnoMobi electronically and agree that all agreements, notices, disclosures and other communications sent by TechnoMobi satisfy any legal requirements, including but not limited to the requirement that such communications should be "in writing". Hyperlinks provided on this Website too non - TechnoMobi sites are provided as is and TechnoMobi does not necessarily agree with, edit or sponsor the content on such web pages.